In a weak world economy where everyone is trying to be conservative with cash, new architectural projects go unbuilt more often than not. That doesn’t stop architects from designing incredible structures, though – it only means that they have to come up with slightly more creative ways of sharing them with the world. The Dutch postal service and the Netherlands Institute of Architecture joined forces to bring amazing architecture to the world via augmented reality. The cooperative project aimed to present the public with architecture that would never see the light of day in the real world but still deserved to be admired. 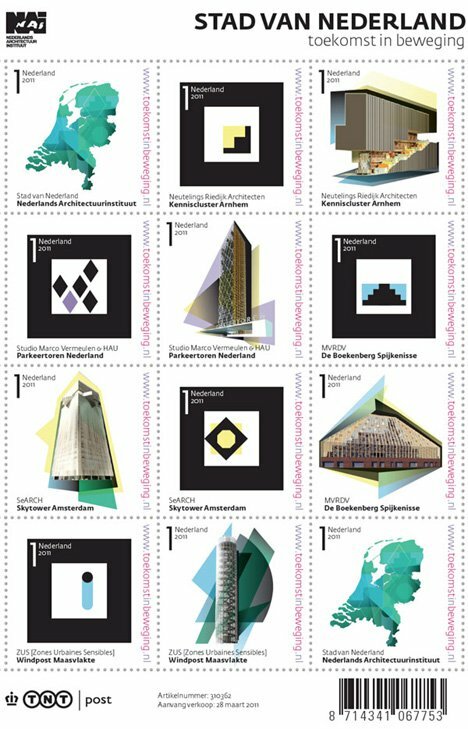 Working with Dutch advertising agency Gummo, the Netherlands Institute of Architecture and Dutch postal service created a very unusual sheet of stamps. Some of the stamps display pictures of unbuilt but visionary architecture. Others contain QR codes that actually bring the structures to life. Holding one of the QR code stamps up to a webcam while visiting the project website makes one of the revolutionary buildings come to life right in the palm of your hand. The project is a perfect example of how technology can help us overcome problems in new and unexpected ways. These wonderful buildings may not be able to find a budget in real life, but putting them into the hands – literally – of architecture enthusiasts gives them a chance to be seen and to provide inspiration.